Everyone is different when it comes to stress relief. There are many coping techniques for stress. Thinking about which ones to use can feel overwhelming. The key is to make sure the coping techniques you choose are healthy and realistic for your lifestyle. Take a look at these meditation and self-care tips from our team of health coaches to get started. Calm can help guide you through mediations, sleep exercises, and other tools for stress relief. It can also track your techniques and progress. Headspace® provides guided mediation sessions and mindfulness training. Color Therapy lets you color intricate pictures. It gives you a creative outlet to help you shake off a bad day or distract yourself. Exercise can play a big role in managing stress, mediating, and unwinding. It can be easy to think of exercise as a chore you have to do. Try thinking of exercise as something you get to do. Find something you enjoy. Remember how good you feel when you are finished. Exercise routines are personal. Some may like lifting weights and running while listening to their favorite motivating music. Others may prefer yoga, dancing, walking outside, or swimming. No matter how you move, be sure to focus on your breath, your surroundings, and how it feels to move your body. Don’t forget to give yourself a huge pat on the back for taking this time for you. Baths: Making time to soak in your tub can work wonders. This self-care strategy can be done at home with limited resources. Don’t forget to make it your own by adding bath salts, candles, music, or scents. This is your time! Essential oils: These can be used in several ways. You can apply them to points on the skin or use them for massage (dilute a drop or two in a carrier oil such as coconut or jojoba). You can also use them in diffusers or in the bath or shower. There are many types of essential oils. Some are options include lavender, peppermint, and eucalyptus. 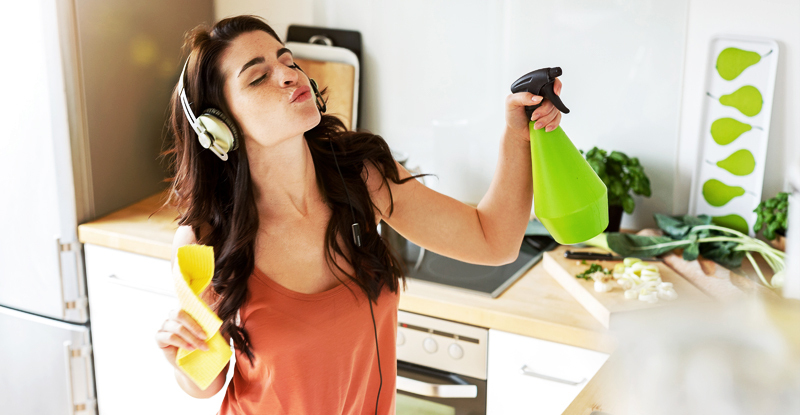 Mood-busting music: Whether you are working out, cleaning, or cooking, listen to upbeat music and feel your mood improve instantly. Empower yourself: Watching motivation and empowerment videos on the internet may also be helpful. This a highly accessible resource right at your fingertips. Focus on the good: Try using a gratitude journal to help you stay grateful and keep a healthy perspective. Keep a small notepad by your bed and write down a few things you are grateful for every day. This can really help shift your perspective in a positive way—especially on a tough day. Bonus: this may help reduce those nagging negative thoughts you have when you are trying to fall asleep. Remember, managing stress in a healthy way is like making any other lifestyle change. It takes planning ahead, strategy, and support. Start by setting a small goal each week and finding time in your routine to incorporate some of these techniques. For example, use a mediation app for 10 minutes in the morning and go for a 15-minute walk in the evening. Let your loved ones know you are going to be working toward these goals and stick to it. Taking care of your responsibilities can be difficult if you aren’t taking care of yourself!